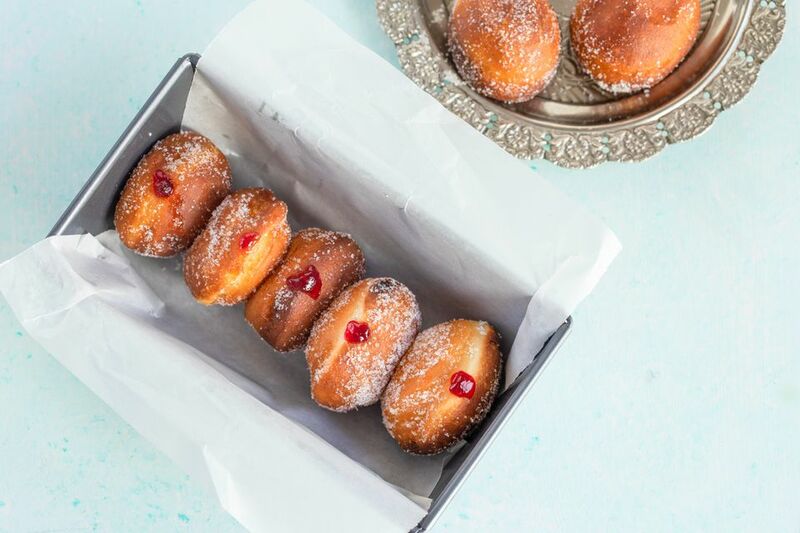 This traditional recipe for Polish pączki (POHNCH-kee) or doughnuts is a splurge food before pre-Easter fasting begins. These fried rounds of yeast dough are stuffed with rosehip, prune, apricot, strawberry, raspberry or sweet cheese filling. Some make these puffy dough balls without filling and roll them in granulated sugar. In the United States, Fat Tuesday, also known as Shrove Tuesday, Mardi Gras and Pączki Day, is the day to indulge before Lent begins. In many parts of Eastern Europe including Poland where it is known as Tłusty Czwartek, however, Fat Thursday (the last Thursday before Lent) heralds the winding down of Carnival season and that's when fried foods like pączki are eaten with abandon. While Americans are consuming enormous quantities of fried food on Fat Tuesday, in Poland, herring is being consumed in great quantities on Herring Day is also known as Śledziówka. For less of a calorie load, try baked pączki. Note: wile there are multiple steps to this recipe, this Polish pączki is broken down into workable categories to help you better plan for cooking. In a large bowl or stand mixer fitted with the paddle attachment, cream together the sugar and butter until fluffy. Still using the paddle attachment, add 4 1/2 cups flour alternately with the milk-yeast mixture and beat for 5 or more minutes by machine and longer by hand until smooth. Old-fashioned directions call for beating the dough with a wooden spoon until it blisters. The dough will be very slack. If too soft, add remaining 1/2 cup flour, but no more. Place dough in a greased bowl. Turn to grease the other side. Turn dough out onto a lightly floured surface. Pat or roll to 1/2-inch thickness. Cut rounds with a 3-inch biscuit cutter close together so you will have fewer scraps. Remove scraps, and re-roll and re-cut. The next step is to fry them. In a large skillet or Dutch oven, heat oil to 350 F. Place pączki top-side down (the dry side) in the oil a few at a time and fry 2 to 3 minutes or until bottom is golden brown. Flip them over and fry another 1 to 2 minutes or until golden brown. Make sure the oil doesn't get too hot so the exterior doesn't brown before the interior is done. Test a cool one to make sure it's cooked through. Adjust cooking time and oil heat accordingly. Drain pączki on paper towels or brown paper bags. Roll in granulated sugar while still warm. If you want to fill them, poke a hole in the side of the pączki and, using a pastry bag, squeeze in a generous dollop of the filling of choice. Then dust filled pączki with granulated sugar, confectioners' sugar or flat icing. Pączki doesn't keep well, so be sure to gobble them up the same day you make them or freeze them. This recipe calls for 1 whole egg and 3 egg yolks, so freeze the leftover egg whites and save them for recipes like this meringue torte. Always use caution when working with hot oil, especially around children. Have a fire extinguisher designed for grease fires at the ready.